Yet rarely does it go down this way. People have become accustomed to either not replying at all, or replying with some pre-programmed impersonal reply. Just now I got a “yep” when thanking a guy who held the door open for me. Yep? Gee, buddy, you have quite the way with words. WTF. Yep doesn’t even make sense as a reply to “thank you.” Yep is slang for “yes” which would be a way to answer a question in the affirmative. I’m pretty sure I didn’t say “thank you?” to the guy. I was not asking him a question. 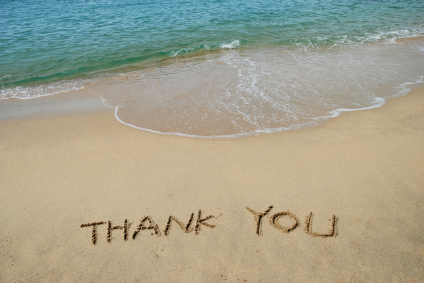 When people fail to acknowledge my thanks, I think I am going to go out of my way to take it back. Me: Never mind, I rescind my thanks and I hope you step in a puddle. Do yourself a favor and actively try to thank people who show you kindness, and be sure to give them a sincere “you’re welcome” when they thank you. 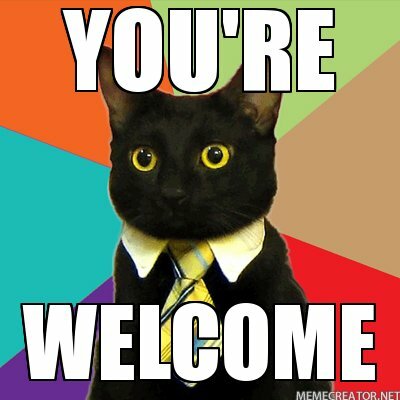 Nothing says ‘you’re welcome’ like a cat wearing a tie. This entry was posted in Common Sense, Miscellaneous and tagged anxiety attack, Common Sense, dating, humor, impersonal reply, observation, people watching, relationships, society, talking, thank you, you're welcome. Bookmark the permalink. OMG…hilarious, yet makes soooooooooo much sense!!! I hope you’re not still disgusted with yourself. I’d like to say “no worries”, but I think I better not.